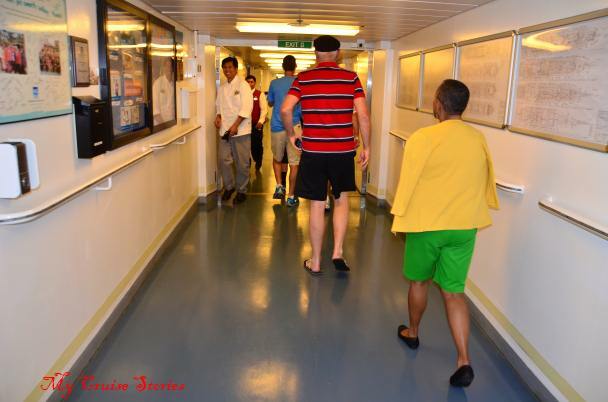 Sometimes cruise ships offer passengers an opportunity to take a behind the scenes tour. 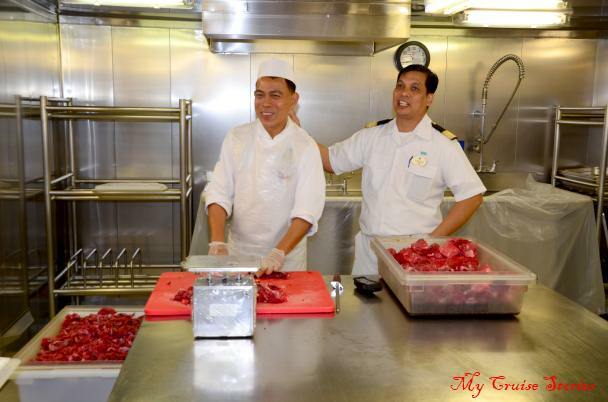 Some ships have galley tours open for anyone. Others offer a more comprehensive behind the scenes tour to a limited number of passengers. Passengers stroll past doors marked “crew only” on a daily basis. This tour offers the opportunity to see what lurks behind those mysterious doors. 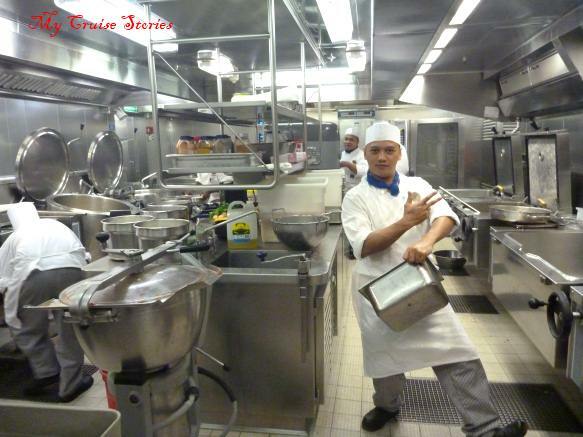 We were invited to take a behind the scenes tour on the Norwegian Pearl along with some other passengers. First we had a tour of the galley. It sits between the two main dining rooms. The galley has separate sections for various types of food. Meat, fish, and poultry each have separate prep rooms so no cross-contamination can ever occur. 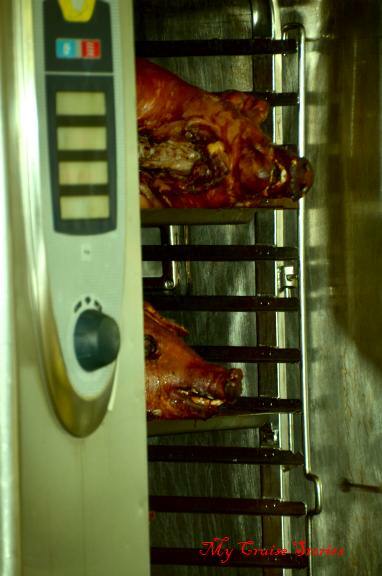 The meat has special cold lockers where it thaws at specific temperatures for preset times before use. In the bakery area they bake fresh breads daily so all bread consumed aboard the ship is always freshly made, including buns for the burgers and hot dogs. 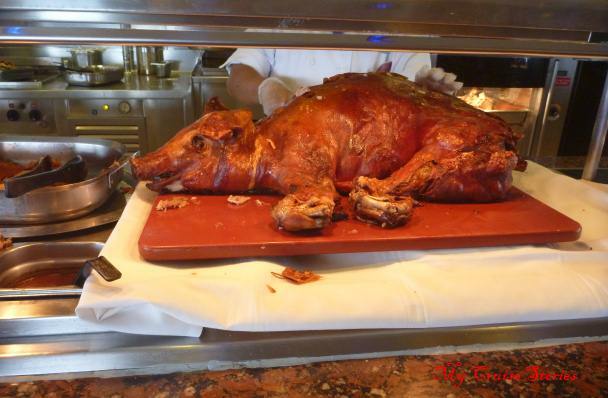 About the time we walked past a set of ovens, one of the galley crew pulled a whole roast pig out of one of them, destined for the special Bavarian lunch at the Great Outdoors buffet that day. Just the mention of the word Bavarian always makes me think of Leavenworth, a Bavarian-themed town in Washington State. 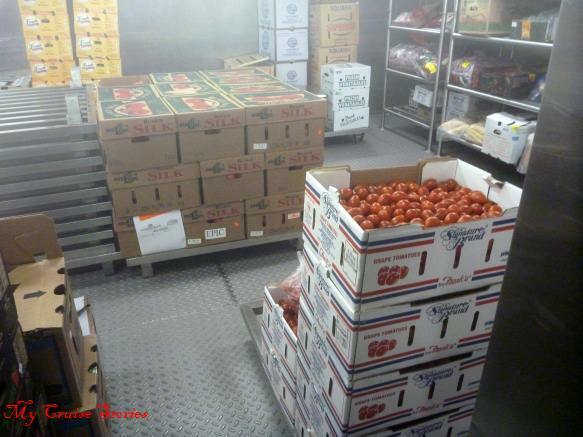 A serious of room-sized walk-in refrigerators and freezers hold everything from eggs to meat to fresh fruit. 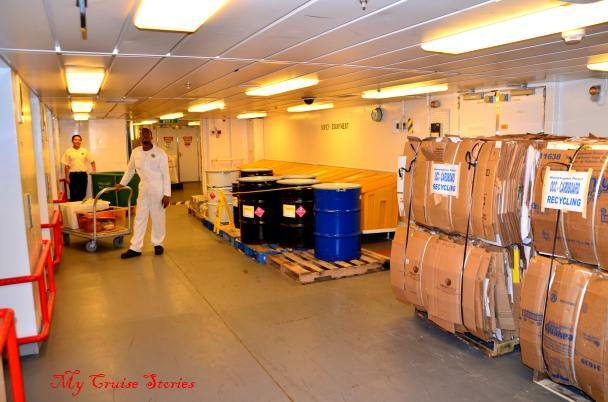 When one cruise ends, all new products load to the back so anything not consumed on the prior cruise gets used first. In the center of the ship the crew of the Pearl has a corridor they called I-95. It’s the longest corridor in the ship. For the crew, it is like a freeway where they can quickly move from one area of the ship to another and then take the appropriate stairway or elevator to get where they need to go. The crew has all sorts of secret passages and elevators where they can get from one place to another while bypassing anywhere passengers go. Down in the bowels of the ship an area exists for gathering recycling to offload in port. They have a special room to smash and bale things like cans and cardboard. Broken dishes sit in a box alongside the other recyclables. The ship even has its own water treatment plant. 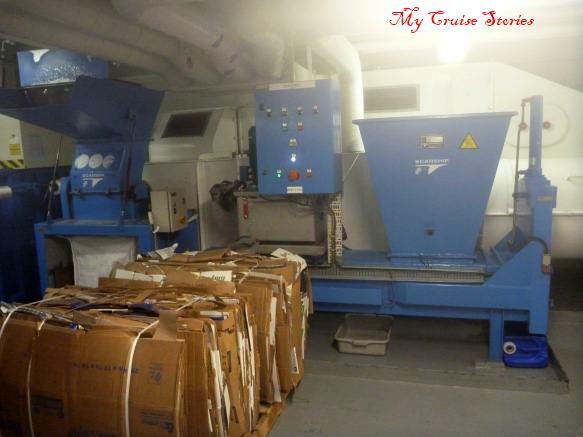 Cruise ships recycle everything that can possibly be recycled. Besides the expected large washers and dryers, the laundry area has all sorts of other interesting things. 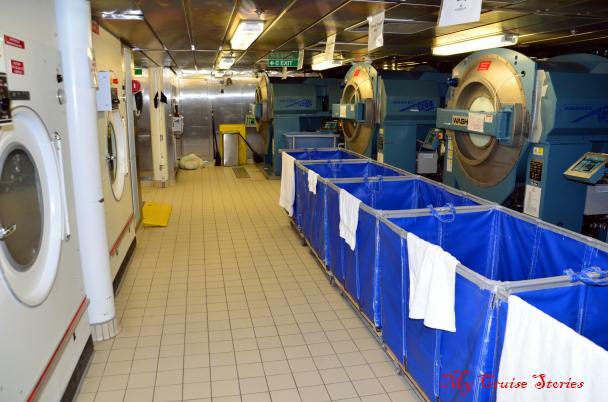 In addition to a multitude of towels and sheets, they will also wash clothes for passengers. Since the Pearl has no self-serve laundry facilities it is the only way to get clothes laundered other than hand washing. The laundry on the Pearl has large clothing presses, and some steam presses that blow the clothes up like a balloon while they steam. 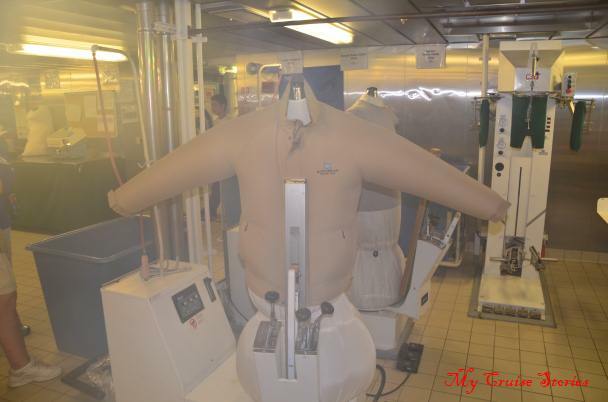 An ordinary jacket on the steamer almost resembles a space suit the way it puffs up. 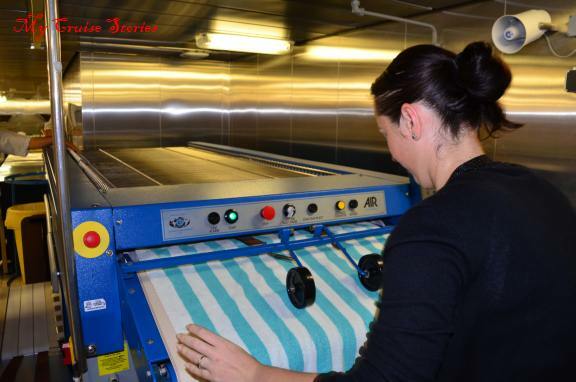 Around a corner from the steamer, sheets, tablecloths and towels each have their own folding machines. The crew stuffs the item in one end of the machine and it comes out the other end folded uniformly with all other items of its type. That explains how everything on a stateroom steward’s cart is always folded exactly the same. 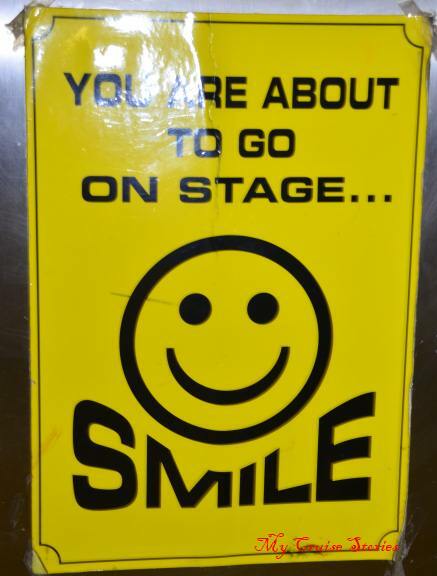 A door from the crew area opens directly backstage in the theater. Performers learn the shows on land, then new performers to a ship have a practice week on board before the prior cast leaves so they can adjust to the moving stage of a ship at sea. The backstage area of the Pearl that we saw consisted of a very small area no bigger than a hallway, although there must be a place somewhere to keep costumes and stage sets. We just passed through a doorway from the crew area to the area directly behind the curtain where there wasn’t much to see, then exited through the theater where the passengers come in and out for shows. 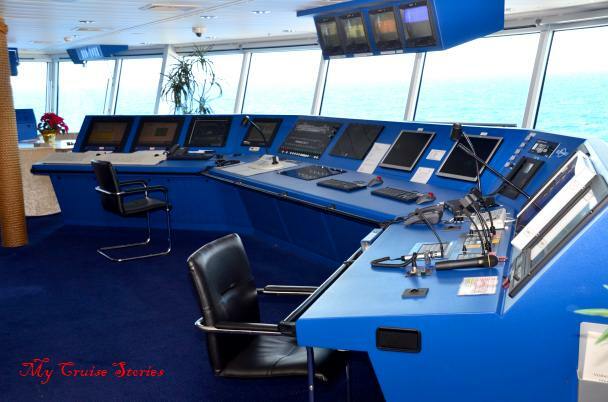 Up on the bridge, the chief navigation officer plots a course, which the captain must approve. Mostly the ship runs on autopilot, but if necessary officers can steer it. The Pearl has the usual mostly unused small wheel on a big ship. When the need to steer around a ship or whale or something arises they use a tiny joystick instead. 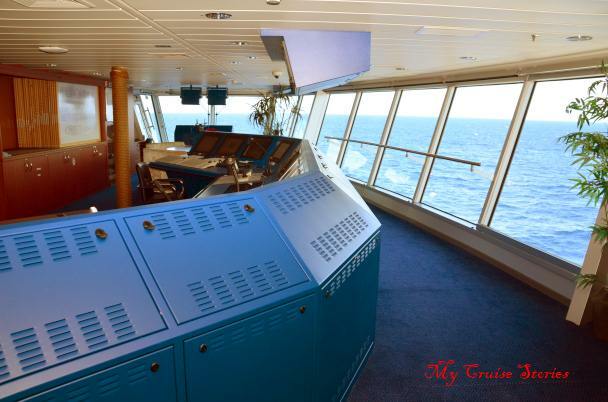 The captain takes the helm during docking and is present on the bridge through any critical areas. Otherwise another member of the bridge crew often takes the helm. 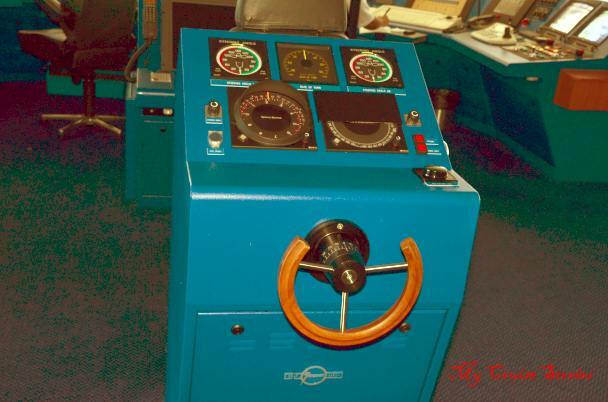 In addition to the central controls, each side of the bridge is equipped with controls for docking so the captain can stand on the side where the ship will dock. Each side also has a floor window where the captain looks down to align the ship with the dock. Several years ago I took a cruise on the Norwegian Sun. It just happened that the very same captain, Captain Rune Edvin Myer, who captained the Sun at that time was captain of the Pearl on our Pearl cruise. Quite a coincidence for two cruises from opposite sides of the continent on different ships several years apart. The Pearl has a bridge viewing room, so any passenger at any time can view the bridge whenever they would like without having to take the behind the scenes tour to see it. 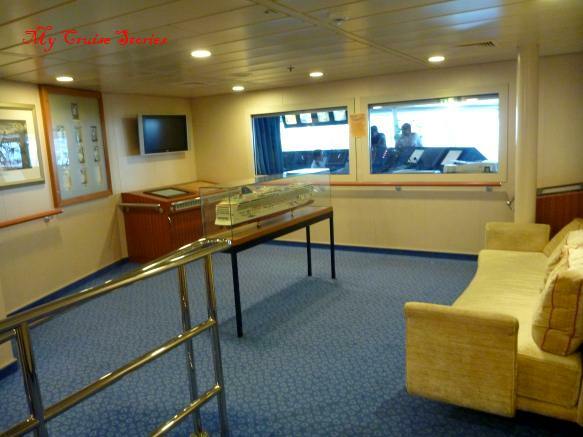 The bridge viewing room contains a model of the ship in a glass case and nautical memorabilia on the walls. 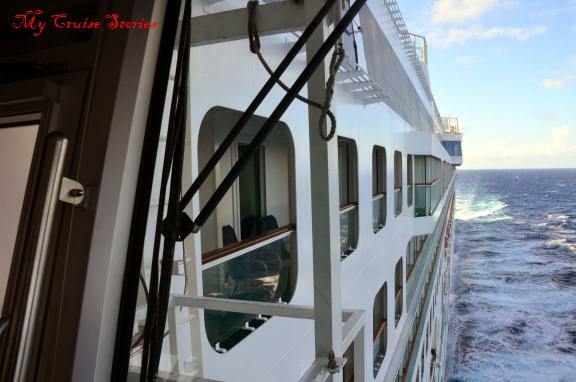 This entry was posted in Norwegian, Pearl, Shipboard Life and tagged behind the scenes, below decks, bridge, cruise, cruise ship, cruise ship tour, galley, Norwegian Pearl, photos. Bookmark the permalink. How interesting to see what goes on behind the scenes. I think I need that folding machine. How cool would that be to have at home! You would need a large room to put it in. They take up quite a lot of space, especially the sheet folder. I really enjoyed your look behind the scenes. I’ve never taken a ‘behind the scenes’ tour, but I’ve often thought about it. Thanks for doing this! This is really a great article about behind the scenes on the cruise ship. Good going! When I think of Bavarian I think of doughnut filling and beer. Both of which they have done very well. That sheet folding machine kinda looks like a press brake if you put a cage in the way of the tooling. 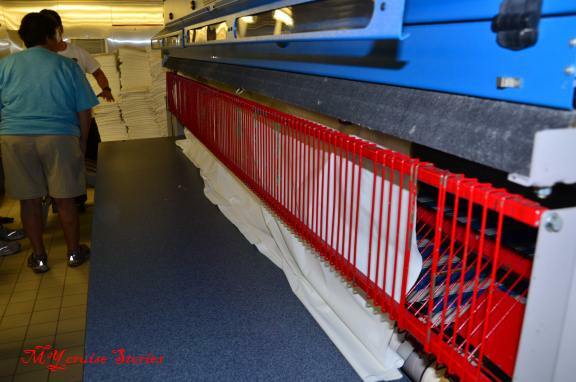 The photo is just the end of the sheet folding machine where it goes in. I can see where just that portion of it could resemble a press brake, but the whole thing is much larger. It spits folded sheets out the other end. I see they still do not have a towel animal folding machine; guess that one’s still in the R&D phase.